It was expected to be another straight forward victory for Marist who traversed through four matches without a loss this season. However, the Kingz had other ideas and their intentions were clear from the get go. Malaita Kingz settled quickly and could have gotten the lead early but Foanaota was off target from close range. Foanaota was on target in his second attempt after a quick series of one-twos with Fono and he beat Phillip Mango. The warning lights started signalling for Marist when an uncleared corner kick was hammered into the back of the net by Fono. The goal was handed to the Fono, who is one of the most dangerous strikers in the league, on a platter and the Marist defence had no excuses to offer. Foanaota then added the third before the half hour mark after chasing a cheeky through pass into the Marist box before going for the far post. Things went further south for Marist when goalkeeper, Mango, was red carded for elbowing Fono in an off the ball incident. While it was true that the Kingz forwarded collided recklessly with Mango, his reaction was caught by the match officials and he was sent packing. Reserve keeper, Santus Kabini, was called in at the expense of striker, Keloby Benty, in a questionable decision by the Marist bench. 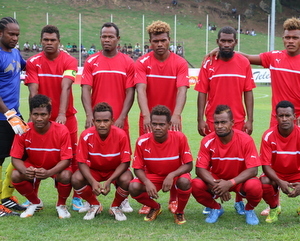 Three nil in front going into the break was a good enough lead but Malaita Kingz were still at risk. The second half saw them tired but their extra man advantage helped them stay above their opposition. Excellent defensive combination from Willie Shem and the Peter brothers, Allan and Brian, also contributed to their remarkable win. Fono wrapped up the game with 20 minutes to spare with a brilliant individual run which saw him beat two defenders before scoring past Kabini.